The first five days have been much busier than we had expected. We did not have time yet to start reading any of the many books we packed for this trip! After unpacking our luggage in the cabin, we found our way around the ship and its daily activities by asking the friendly officers and crew. It is an industrial environment and only by taking the initiative, we got the information we needed. We called at three ports: Zeebrugge in Belgium, Southampton in England and Le Havre in France. The ship remained in each port for 16 – 20 hours, loading its cargo. 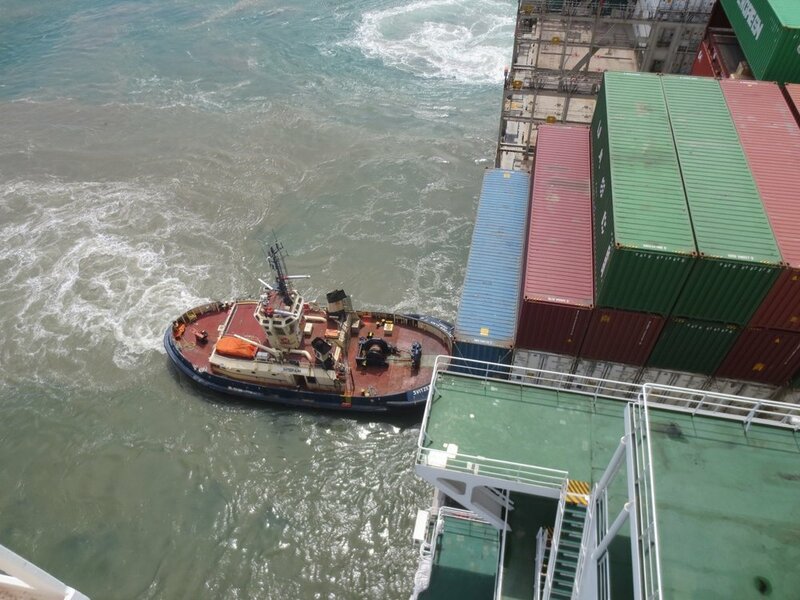 It is being re-supplied, bunkered, on shore contractors do maintenance and the officers are coordinating all the activities with the port agents. We took this opportunity to go ashore as much as possible! As it is too dangerous to walk inside the port area due to the many gantries, cranes and trucks moving around, we had to call the port agents to send shuttle busses to pick us up at the gangway and take us to the port entrances. There we showed our ship ID to get through security, taking a taxi or public transportation to get to the closes city centre. We did some shopping, enjoyed a nice meal and used good internet connections to check our e-mails and chat with family. The departure times depend on the progress of the loading operations and to make sure we would not arrive back at the ship too late, we returned at least three hours before schedule. This gave us ample time to watch the final loading activities on the dock and watched the tugboats pulling us back to sea. The three North Sea crossings for the most part took place at night with calm seas. Lying in bed we didn’t notice we were on a boat. Although our cabin is a mere seven decks straight above the engines, we only hear these as a background buzz. Most impressive was the approach into the port of Southampton. In the morning of day 3, we saw the cliffs of the Isle of Wight when the pilot boarded the ship. Francien and I watch him and the captain on the bridge manoeuvring on the 16 Km long Southampton Water to our quay. We saw the skyline of Portsmouth, old forts, wharves, marinas, piers, a power plant, refineries, warehouses, ferries and four cruise ships. It was a Saturday morning in Southampton, the sky clear blue, temperatures around 27 C and a three knots breeze, so hundreds of sailing boats were on the water. The bridge towers 45 meters above the waterline, giving us a commanding view! Those sailing boats looked so tiny and even the cruise ships could not impress us with their size. The pilot had received the help of a patrol boat to keep all those pleasure boats out of our way. He pointed to the pier where once the Titanic moored, telling us that his grandfather was the captain of one of the tugboats which pulled this infamous ship out of the port! A vintage steamboat passed and our pilot knew its captain. Via radio they agreed to signal each other with the ship horns. The whistling vintage sound of the steamboat was beautiful and the pilot request them to repeat this a few times just for us! The last mile to the container terminal the pilot instructed three tugboats to dock us gently to the quay. Our next port of call will be Beirut in Lebanon, eight days sailing. Now we will experience being at sea for a very long time! !